I’ve been looking forward to this story ever since I read Goddess Tithe (you may recall my review of that novella HERE). It was in that story that I fell in love with Sunan, the captain of the Kulap Kanya. I did not realize that this book would contain his back story, and was delighted to find more information about him within the pages. But though Sunan’s back story is captivating, the novel centers around Masayi Sairu, one of the Emperor’s Golden Daughters. Trained from birth to be delicate, demure, and lethal, Sairu awaits the highest bidder to betroth her to a powerful man whom she will guard for the rest of her life. But when a strange request is brought forth, Sairu does the unthinkable: she chooses her own assignment. Now she must guard a Dream Walker from the temple on a dangerous journey to a monastery high in the mountains. Getting there is only one step of the quest, however, for perils beyond those of bandits and thieves await… for the Dragon is building an army, and he has set plans in motion to find this Dream Walker and kill him, for he is the only one who has a chance of impeding the Dragon’s plans. Aided by an arrogant and saucy faerie cat (who is everyone’s favorite faerie bard! ), Sairu will throw her own life away to defend her charge. But when she meets a young barbarian prince, her heart betrays her, and she finds her loyalty divided. Full of mystery, intrigue, and a lot more politics than in previous stories, Golden Daughter held me captivated. It is much longer than the previous stories, as well, which is not a bad thing, as I love long stories. There were moments where I felt that this book dragged a bit in places, but not so much that it hampered my enjoyment of the plot or the characters. 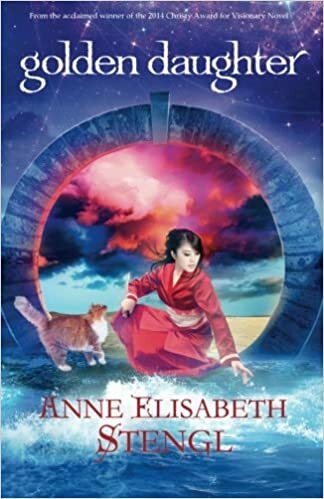 If there is one thing Anne Elisabeth does exceedingly well, it is create extremely interesting, well-rounded, likable characters who just seem to step off the page into real life. Although this set of characters is mostly new, I fell completely in love with them. My favorite character in the book (besides Eanrin, of course… though I like him better when he doesn’t spend the entire story in cat form… which is just personal preference… probably because I like him so much and I enjoy it when he goes on adventures himself, as opposed to being in a merely “guardian/observer” type role) would have to be Sunan’s younger brother. I really enjoyed the parallels to the Biblical story of Joseph twined throughout his story, but I also liked the way that the story wasn’t an exact copy of the Biblical story, there were some unique twists thrown in, as well. I also loved Sairu… though there were a few times I wanted to take her by the shoulders and tell her to stop being such an imbecile! I also enjoyed the overall tone of the story. The setting is so different from the other places in which the Tales of Goldstone Wood take place. The story is set in Noorhitam (we’ve been there briefly in a couple of the other tales, but never spent much time there before). There are definitely some Far Eastern influences being brought to play there, a lot of Chinese/Japanese feel to the culture and landscape… which I expected. What I didn’t expect was to find so much Hebrew-in-Old-Testament-times influences and flavors, as well. It made for quite the unique experience. As Dame Imraldera tells you at the beginning of the book, you can most definitely read this story without having read the rest of the series. But I beg you, DON’T DO THAT! Go pick up Heartless and proceed through the series in order. It will be a much richer and more profound experience if you do. Overall, this book is a beautiful and powerful addition to the Tales of Goldstone Wood. Though Shadow Hand is still my favorite, this comes in at a close second. I LOVED this book so much. I liked the world,the characters, the beautiful writing, Eanrin… It’s one of those “big” books that makes me feel like it still wasn’t large enough. If only her next book would release soon. She said that a new book is coming in May!!!!! So excited! Not sure what it is, but that information will be coming out in March in tandem with the announcement about the winners of the Five Magic Spindles contest! Happiness!